Traditional IRA vs Roth IRA - Which is Better for a 'Typical' Family? In the personal finance realm it seems that most everyone is hopelessly in love with the Roth IRA. I've seen people give blanket general advice that everyone should use a Roth IRA for their retirement savings. There are a lot of scenarios where a Roth IRA is a poor choice. Don't get me wrong, a Roth IRA is a good way to save for retirement but its not always the most optimal. Today I'll look at an example of a 'typical family' and see how their retirement will fare if they use a Roth IRA exclusively or if they use a traditional IRA instead. Assumptions for our 'typical' family: You make exactly the median income for your age. In your mid 20's you have 2.3 children (we'll round down for simplicity). Then lets say you're less typical in that you consistently save a full 10% of your pay towards your retirement and then get a consistent 8% annual growth through fairly smart investing. I got the income data from the Census. I'm just assuming you make the median income level of each age group over your life. For taxes I'm assuming that the earliest age you're a single person. Then between age 25 and 44 I'm assuming you're married with two kids. Then after 45 years old I assumed the kids would be out of the house and you'd be filing as a married couple with no dependents. I figured the tax bills with the TaxCaster online calculator. TaxCaster does a good job of figuring all the credits and makes estimating the tax bill pretty easy. 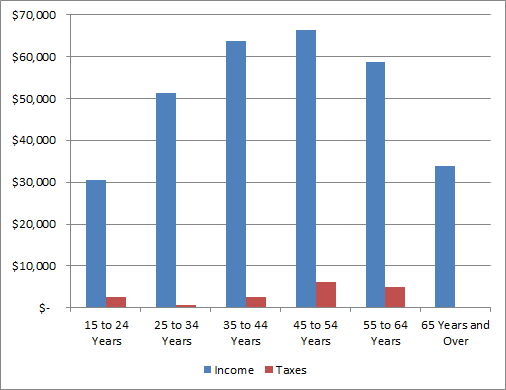 You'll notice the taxes are pretty low during the 25-34 year period. That is because of child tax credits and the two exemptions for dependent children. Right now based on current tax laws your marginal income tax bracket would bet 15% for the entire time if you make the median income level for the given age group. So we're assuming your income will grow steadily over time due to promotions and increased experience. In addition to this you will also see wage increases due to basic inflation. I'm going to also assume a general 3% annual inflation rate. 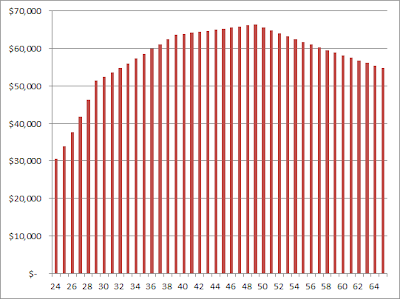 Now once we have an assumed income pattern over time I can figure out the retirement savings. I'm going to go with a flat 10% retirement savings rate and also assume 8% annual investment growth. Based on all these assumptions, I figure that if you start work at age 24 and work until age 65 that you will have accumulated $2,386,085 in a Roth IRA account. If on the other hand you wanted to save an equivalent amount of post-tax money in a Traditional IRA then you'd be saving about 18% more. Thats because if you save the money pre-tax then you won't have to pay taxes on it, and at the 15% tax bracket that comes out to about 18% extra money pre-tax. Now if you save over the same 41 year work history via a Traditional IRA with the same 8% investment growth then you'd have a total of $2,807,158 in your retirement. You would also qualify for household social security income of about $24,000. I used the Social Security quick calculator to estimate the monthly SS payments at full retirement age. The exact amount of social security will vary based on the exact work history and whether or not you've got one spouse working with $60,000 income or two working spouses making a combined $60,000. But I'm assuming a $24,000 figure which is in the ballpark of what such a couple will likely get. Of course this is based on todays Social Security rules which are subject to change. With the Roth retirement you'd pay no taxes and none of your social security would be taxable so you'd have a tax bill of $0. With the traditional IRA you would owe taxes on your withdrawal and you'd be making enough income that some of your social security would be taxable. You can use the How much of my social security benefit may be taxed? calculator to find out how much of your income is taxable. That calculator figures with a $33,420 IRA withdrawal that 30% of your social security would be subject to taxes. That would give you a total taxable income of $7,200 from social security and $33,420 from the IRA or $40,620. Taxes for a married couple on $40,620 will run you $1,841. Thats a difference of $3,172 more per year you'd have with the traditional IRA route over the Roth IRA. This is a boost of 6% to your take home after tax income. Of course this example has a lot of variables and assumptions and changing any of them could change the picture some. We don't know what taxes will be like in 40 years. We don't know how social security will work in 40 years. We don't know if your income will have a pattern like I'm assuming. We don't know what inflation will do. We don't know how your investments will grow. Its all a crap shoot. But I think the assumptions I'm making are reasonable and based on historical norms. When projecting estimates like this 40 years into the future thats about the best you can do, make assumptions based on historical averages and use current rules.